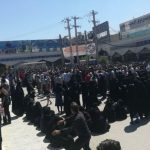 Brave people of Kazerun took it to the streets again to protest against Iranian regime’s repression. On Wednesday, the 16th of May, demonstrators in Kazaroon resumed protests in defiance of Iran’s clerical regime. The city’s market was closed, and shopkeepers refused to open their stalls in protest. Hundreds of protestors took to the streets to vent their frustrations at proposed changes to the city’s boundaries. With slogans directed squarely at the regime, the people chanted, “our enemy is right here” and “beware of the day we will be armed”. Expressions of solidarity also rang out, with chants of “do not be afraid, we are all together”. The demonstrations began outside the city’s government offices. However, the State Security Forces took measures to block the protester’s access to the building. The regime resorted to repressive and violent strategies to restore order, arresting around 30 demonstrators. The mass arrests prompted protestors to gather outside the police station and the headquarters of the security forces. The demonstrators demanded the release of their loved ones from custody in an effort to disperse the crowd, the security forces fired tear gas and fired live ammunition into the air. The people showed their resolve and determination and would not be moved. Then the regime’s agents opened fire on the crowd. Two young people were killed and many more wounded in the confusion.y. Maryam Rajavi, president-elect of the National Council of Resistance of Iran (NCRI) hailed the heroic martyrs of Kazerun and the city’s brave and bereaved people. She has called for the immediate release of those arrested and urged her compatriots to rush to the aid of those wounded. Mrs. Rajavi also called for the dispatch of a UN investigative delegation and a representative of the UN High Commissioner for Human Rights to examine the situation first hand. The protestors defended themselves against the unprovoked violence. They threw stones and wood and set a police station alight. 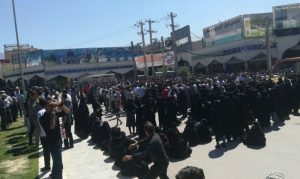 Clashes continued across the city until the early hours of the next day, when reinforcements for the clerical regime entered the city from Shiraz. The Iranian Resistance movement has urged international human rights groups for assistance in securing the release of those imprisoned.